This summer I had the opportunity to participate in my first Museum Forum for Teachers, a week-long teacher workshop coordinated by The Warehouse, Nasher Sculpture Center, Modern Art Museum of Fort Worth, Kimbell Art Museum, and the Dallas Museum of Art. 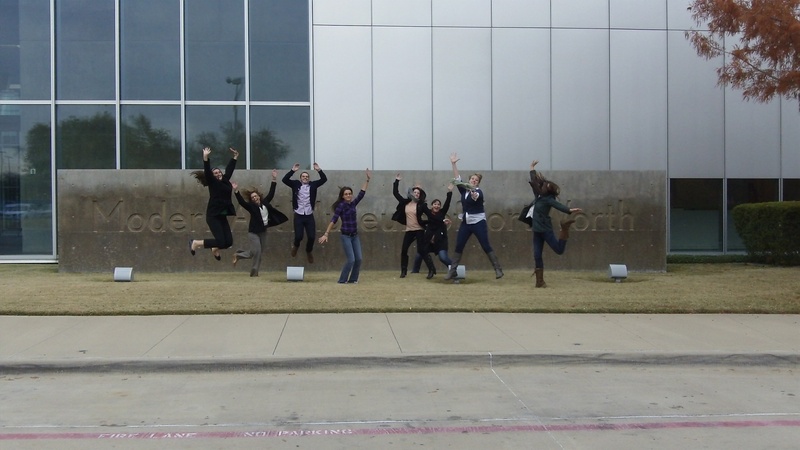 Each day, twenty-four dedicated North Texas educators braved traffic across the DFW metroplex to participate in a full day of museum experiences, discussions, and projects for CPE credit centered around modern and contemporary art. Part of the fun of Museum Forum is that each institution hosts one day of the week, so we rotate and spend time exploring different collections. What could be better than the chance to catch up on current exhibitions and collaborate with a fabulous group of teachers and museum educators! This year marked the ten-year anniversary of Museum Forum. To celebrate, we tried out a daily “Educator Exchange” and led a session at one of the other institutions (we also consumed many, many cupcakes). I shared A Work in Progress: Plaster in the Nasher Collection, and we practiced an exercise called Drawers and Describers in pairs. Discussing the Joel Shapiro exhibition at the Nasher Sculpture Center before creating stop-motion video shorts. Here at the DMA, we tried out a collaborative poetry exercise in Passages in Modern Art: 1946 – 1996. We divided into groups of five, and each group was assigned a work of art in the exhibition. After taking some time to quietly sketch and make notes, each participant wrote down one sentence on a slip of paper from the point of view of the work of art. From there, each group worked together to arrange their responses together into a narrative. Check out their outstanding work! Collaborative poem inspired by Jasper Johns. Dorothea Rockburne, Locus Series #6, 1972, Dallas Museum of Art, Mr. and Mrs. Jake L. Hamon Fund. Collaborative poem inspired by Dorothea Rockburne. Tracy Hicks, Clear Cut, 1985–1986, Dallas Museum of Art, Museum League Purchase Fund. Collaborative poem inspired by Tracy Hicks. Jim Dine, Self-Portrait Next to A Colored Window, 1964, Dallas Museum of Art, Dallas Art Association Purchase, Contemporary Arts Council Fund. Collaborative poem inspired by Jim Dine. Yayoi Kusama, Accumulation,1962–1964, The Rachofsky Collection and the Dallas Museum of Art through the DMA/amfAR Benefit Auction Fund. Collaborative poem inspired by Yayoi Kusama. Speaking for myself, the week was inspiring, immersive, and left me excited to revisit some of the exercises and ideas we explored in upcoming Teacher Programs. 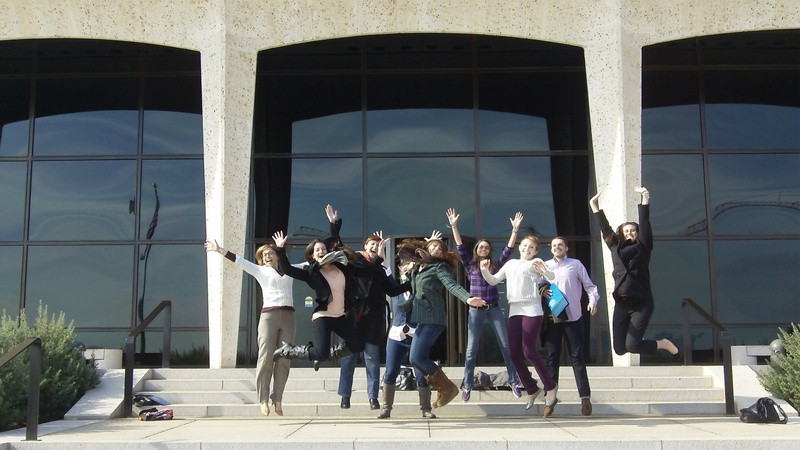 Our participants enjoyed Museum Forum almost as much as museum staff! I love the forum, all of the museum staff involved, and everything you guys do. Thank you so much! I’ll be back next year. I was impressed with EVERY aspect of this. It was the most rewarding (personally & professionally) training I have attended in…forever!!! This is by far the most fun and most challenging teacher conference I have ever attended!! The level of critical thinking necessary blows away anything I’ve done as a teacher in a very long time. Thank you so much!!! 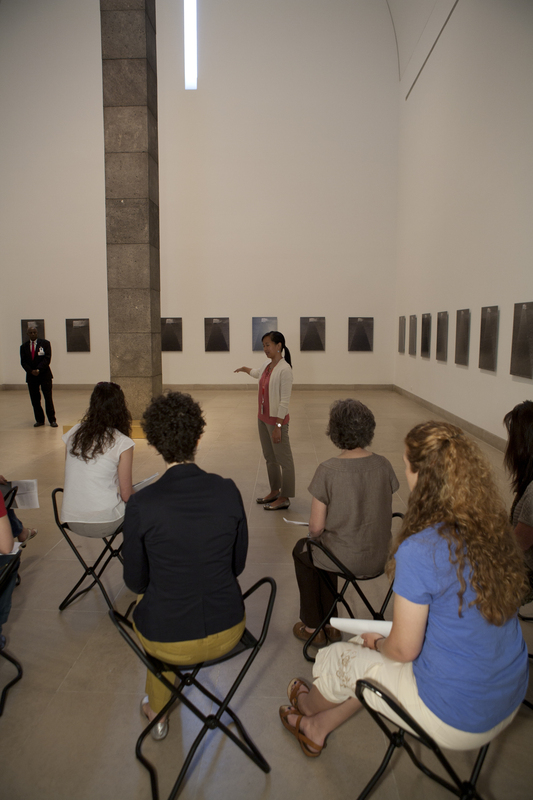 Interested in joining us for Museum Forum for Teachers next summer? Sign up to receive our emails and check the box for Information for Teachers, so you can stay connected to exciting professional development opportunities here at the DMA! Our annual Museum Forum for Teachers has come and gone, and this year was another rousing success. 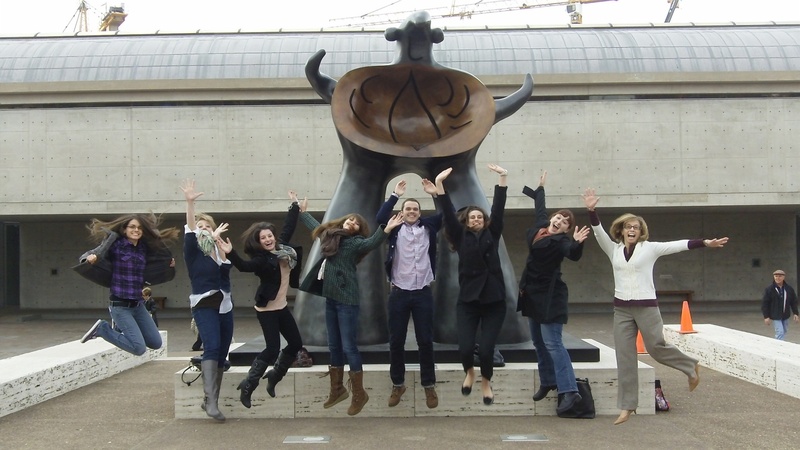 Twenty-two teachers participated in the week-long program, and spent a full day at each of the following Museums: The Rachofsky House, the Nasher Sculpture Center, the Modern Art Museum of Fort Worth, the Kimbell Art Museum, and of course the DMA. During their time at the DMA, the teachers went on a walking tour of the Arts District before spending time in Flower of the Prairie: George Grosz in Dallas. Both of these experiences led to their afternoon art project: creating a watercolor painting of their impression of Dallas. 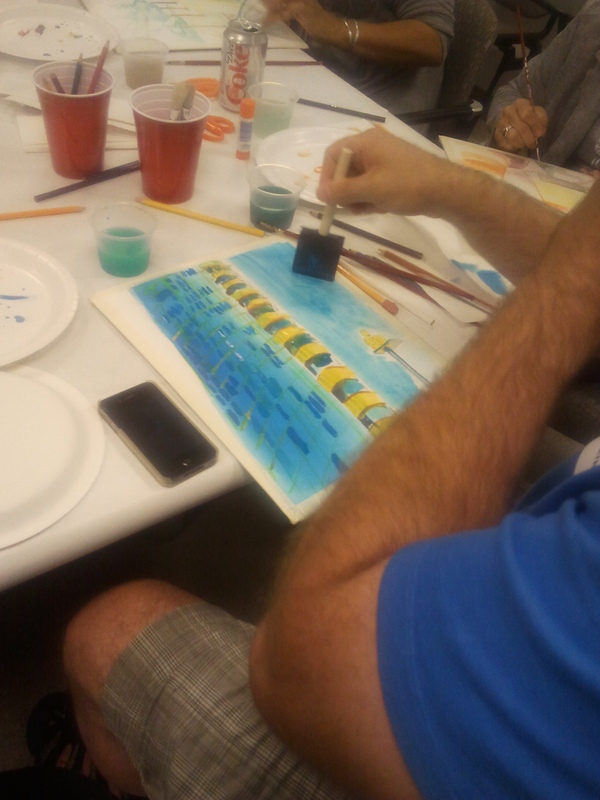 One teacher’s watercolor showed the Nasher Sculpture Center and Museum Tower. 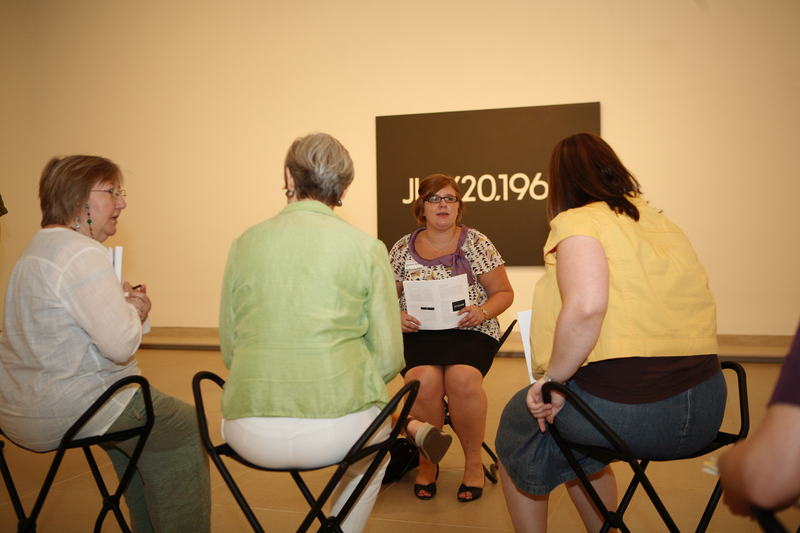 Teachers were also able to spend time in a brand new installation, Variations on Theme: Contemporary Art 1950s–Present. While we were in the exhibition, we focused on the themes of the figure, vanitas, and place. The idea of place was one of our key themes for the day, and we spent quite a bit of time looking at Jack Pierson’s Anytown USA. The letters that make up this sculpture come from a variety of places. 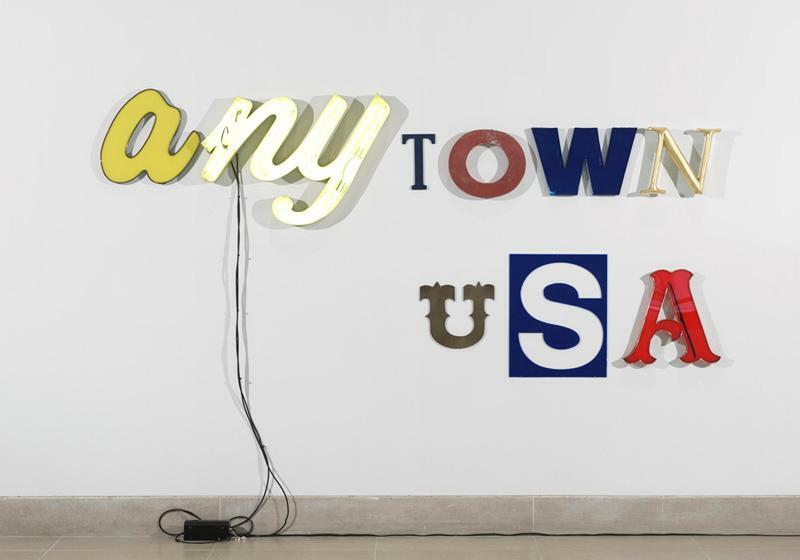 Imagine that each of the letters came from signage on buildings in Anytown USA. Select one letter and write a description of the business you think used that letter in its signage. Remember, your response must be inspired by the look and feel of the font/letter you select. NY: A coffee shop where everyone goes to hang out. Every town has to have a coffee shop. Or, a deli run by a transplant from New York. All of the sandwiches are named after local celebrities. T: An antique or curio store, and all of the employees are eclectic, just like the goods they sell. O: A donut shop where grandparents spend weekend mornings with their grandkids. A city is defined by its donut shops. Or, it’s an old gas station that is practical, functional, but a little bit dirty. They don’t care about the aesthetics of their business, they just want to get the job done. W: This W looks very commercial and slick, like it came from a Walden Books. Or, it could be from a Woolworth’s Five and Dime. N: A feminine upscale hotel, or maybe a newspaper printing office. Or, maybe it’s for a fine art framing shop that has a Thomas Kinkade painting hanging in the window. S: This S looks universal and simple–it belongs to a store called Supermart that sells everything. A: This could be part of the sign of a ball park. Or, it’s the sign for a bar called BAR that’s full of smoke and beer, but is a place to escape. Surprisingly, none of the teachers selected to write about the first yellow A. What type of business do you think that A might represent? I would love to hear your ideas! 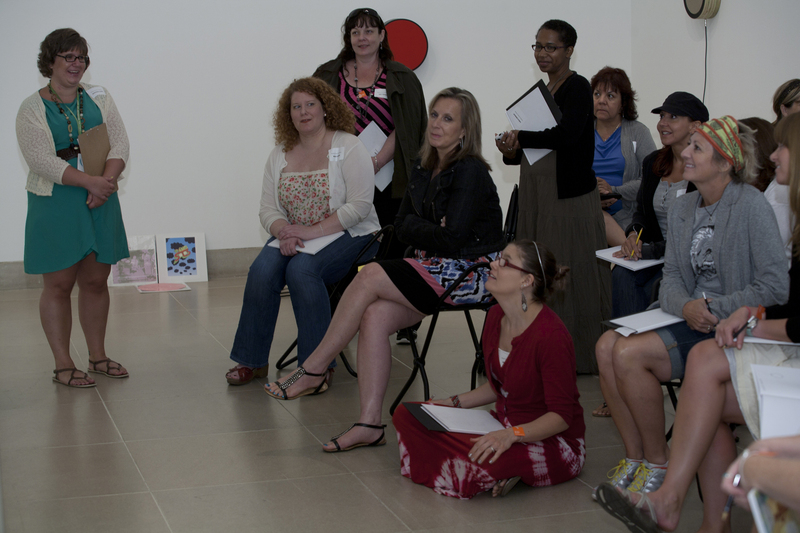 Each summer, the DMA hosts a week-long program called Museum Forum for Teachers: Modern and Contemporary Art. 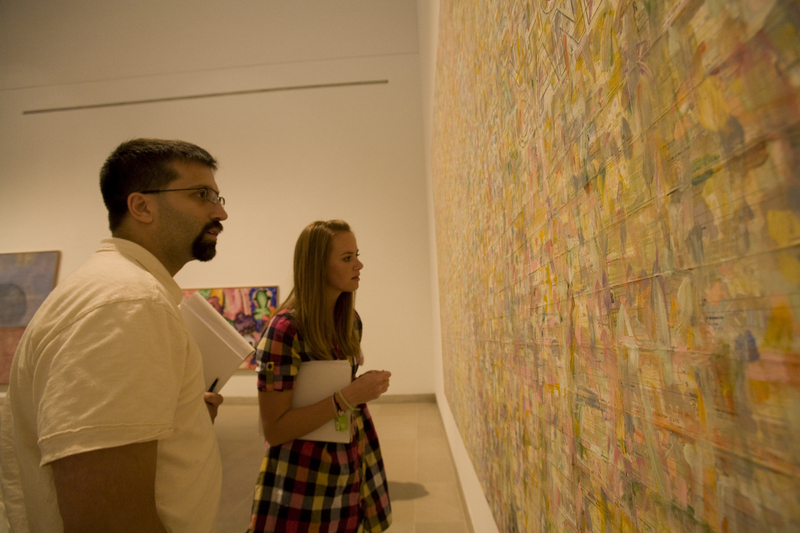 Over the course of the week, teachers spend a full day at five different art museums: The Rachofsky House (a private contemporary art collection located in Dallas), the Nasher Sculpture Center, the Kimbell Art Museum, the Modern Art Museum of Fort Worth, and the Dallas Museum of Art. This year, the Forum will be held from July 23-27. As its title suggests, the focus of Museum Forum is modern and contemporary art. The DMA day this summer will focus on the exhibition Flower of the Prairie: George Grosz’s Impressions of Dallas, 1952, as well as selected works from our contemporary collection. This will be my fourth year to lead the Museum Forum, and for me the week is always an opportunity to feel refreshed and rejuvenated. It’s rare that I have an opportunity to spend five consecutive days in the galleries, and I love the conversations and ideas that emerge over the course of the week. I also feel like I walk away from the Forum learning just as much from the teachers as they do from me. If you want to feel reinvigorated by modern and contemporary art, I encourage you to apply for this year’s Museum Forum for Teachers. The Forum is open to middle school and high school teachers of all disciplines, and enrollment is limited to twenty-five participants. We are currently accepting applications, and a 10% discount will be given to all teachers who apply by our early application deadline of March 30. The regular application deadline is May 25, and all teachers will be notified of their acceptance by June 8. I hope you’ll consider joining us! Uncrated recently took a “field trip” to Fort Worth to visit the Kimbell Art Museum’s presentation of Picasso and Braque: The Cubist Experiment, 1910–1912, for which the DMA loaned its 1912 Braque painting Still Life with Bottles and Glasses. Before the exhibition opened, the Kimbell’s director of conservation, Claire Barry, took a look at our “gem of a painting” and offered us this guest post on the experience. X-ray of George Braque's "Still Life with Bottles and Glasses"
I was delighted to have the opportunity to examine Braque’s Still Life with Bottles and Glasses from the DMA in the Kimbell conservation studio. Fortunately, this gem of a painting is unlined, which is rare for a cubist painting from this period. As a result, the impastoed (thickly textured) surface has never been flattened through lining. As one of my teachers wisely advised, think about a painting as a sculpture in low relief. If you look at the Braque in this way, you quickly begin to appreciate the rich variety in the artist’s application of paint—from thin areas where the paint is more fluid to thicker areas of impasto where he applied paint with a heavily loaded brush. Then, in the upper left, you might notice that the paint has a crusty texture that seems totally unrelated to the composition. 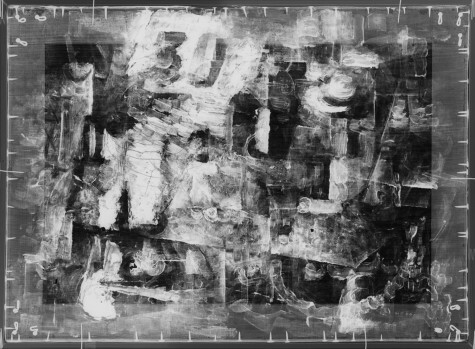 With the permission of the DMA curators, I x-rayed the painting, which quickly revealed that Braque completely reworked the composition of Still Life with Bottles and Glasses during the course of painting. The texture of the underlying paint layers, later covered over, can still be seen on the surface. 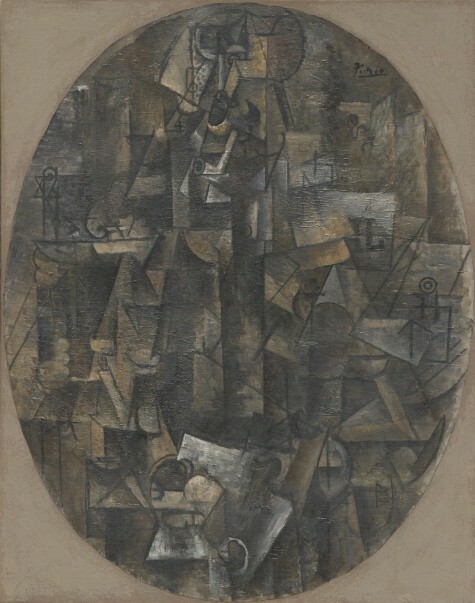 I was fascinated to discover this, because between Picasso and Braque, I always believed that Picasso had a greater tendency to radically rework his paintings (as he did with the Kimbell’s Man with a Pipe). Braque painted the Kimbell’s Girl with a Cross without making a single revision. I was fortunate to be able to examine the two Braques, the DMA’s and the Kimbell’s, side by side in the conservation studio. Like the DMA painting, the Kimbell’s Girl with a Cross is unlined and preserved in pristine condition. In fact, it has never been varnished and retains the matte surface that the cubists intended. Both Picasso and Braque were adamant that their paintings should never be varnished. 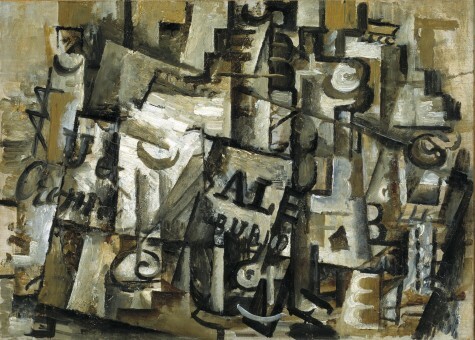 The DMA’s Braque, however, had been varnished at some point, and the varnish layer imparted a glossier surface than Braque had in mind. The unifying effect of the varnish also masked the subtle differences in surface gloss and texture that Braque created. In preparation for the exhibition, the DMA gave me permission to remove the varnish layer from Still Life with Bottles and Glasses. The fact that visitors to the exhibition can now see two unlined, unvarnished cubist paintings by Braque is really something exceptional. When you see the surfaces of these paintings, you can feel confident that this is very close to how they appeared when they left Braque’s easel some one hundred years ago. 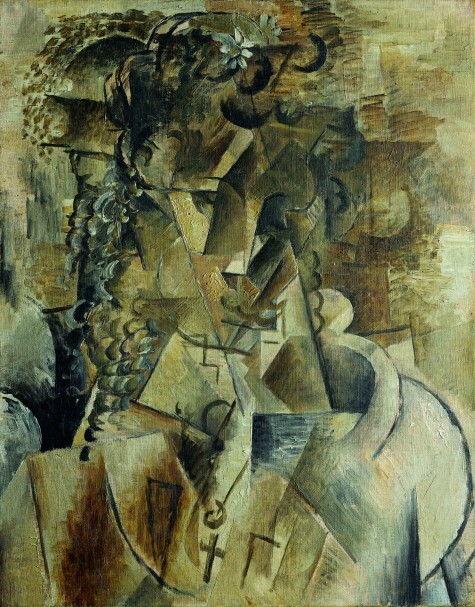 Braque’s Still Life with Bottles and Glasses (1912) was sent to the Kimbell for spectral-image photography during the early stages of planning the exhibition Picasso and Braque: The Cubist Experiment, 1910–1912. These photographs are among the many incredible high-resolution digital images that can be explored with the iPad application iCubist in the Kimbell exhibition. If you want to experience the details in cubist paintings, brushstroke for brushstroke (the way I examine paintings in my job as a paintings conservator), I really recommend that you check out the iPads at the Kimbell. To my knowledge, this is the first time such images have been made available to the public in such an interactive way in a museum exhibition. The goal is to enrich the experience of seeing the real paintings, for which there is absolutely no substitute. My hope is that the iPad application may encourage visitors to spend even more time in the exhibition. Unlike the Acoustiguide, you cannot look at a painting and the iPad app simultaneously. So perhaps this will encourage visitors to look at the paintings first, then explore the iPad, and then return to the paintings for a second look, with greater understanding and appreciation. Guest blogger Claire Barry is the director of conservation at the Kimbell Art Museum.